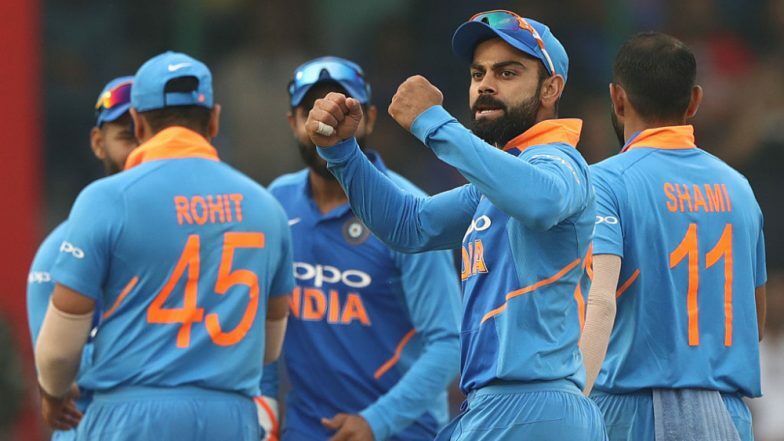 The Board of Control for Cricket in India’s (BCCI) senior selection committee on Monday, April 15, named India’s squad for the ICC Cricket World Cup 2019. Virat Kohli will lead the Indian team who will be looking for their third world cup title and Rohit Sharma has been named as his deputy. Selectors have included KL Rahul, Vijay Shankar, Ravindra Jadeja and Dinesh Karthik and left out Ambati Rayudu and Rishabh Pant. ICC Cricket World Cup 2019 Schedule in PDF: Ticket Prices, Dates, Venue Details & Timetable Available for Download Online. The ICC Cricket World Cup 2019 is scheduled to begin on May 30 in England and Wales. India after landing in England will take on New Zealand at The Oval in London on May 25 in their first warm-up fixture. On May 28, India will face Bangladesh in their second warm-up fixture at the Cardiff Wales Stadium in Cardiff. India then begins their ICC Cricket World Cup 2019 campaign on June 05 against South Africa at the Hampshire Bowl in Southampton. The ICC Cricket World Cup 2019 will have a round-robin format and all participating teams will face against each other once. Top four teams will then proceed to semifinals. India is scheduled to take on arch-rivals Pakistan on June 16 at the Old Trafford in Manchester. India’s round-robin matches concluded on July 06 with an encounter against Sri Lanka at Headingley, Leeds. Vijay Shankar Included in Team India for ICC Cricket World Cup 2019, Check Full 15-Man Squad. Can the 15-member India Squad announced by BCCI win ICC Cricket World Cup 2019? The semifinals of the ICC Cricket World Cup 2019 will be held on July 09 and 11 at Manchester and Birmingham respectively. The final of the world cup will take place on July 14 at the historic Lord’s London.